﻿"The past history of Ulster is but a portion of Scottish history inserted into that of Ireland - a stone in the Irish mosaic of an entirely different colour from the pieces that surround it." I know some of the folk coming on the bus tour on Saturday are readers here, so this is just a reminder that the coach will be leaving Ards Square at 8.45am, first stop is Newtownards Priory, which the Northern Ireland Environment Agency are opening up specially for us. We plan to be back at the Square for 1.00pm. If you can't make it please get in touch as there are people on a waiting list in the hope of cancellations. If the weather holds it'll be a great forenoon... if it rains, well, Hamilton and Montgomery didn't go back home in 1606 because of a wee skiff now did they? :-) Will post a report and photos next week. While Ulster-Scots continues to be the easy target of choice for the Northern Ireland media and chattering classes, ordinary folk take very little notice. Because for them, the connection with Scotland is deep and real, with generations of unspoken understanding of their Ulster-Scots heritage. The here-today-gone-tomorrow stoked "controversies" just pass by like a mizzle in the forenoon. A wheen o' weeks ago, I spent an evening with a family who live near Ballyfrenis (I'm going to keep them anonymous just for their own privacy), who shared with me an Aladdin's cave of old photographs and paper records going back into the mid-19th century. They are readers of this blog, which led to the invitation to go round and see them, and have given me permission to copy and post here some of the items. 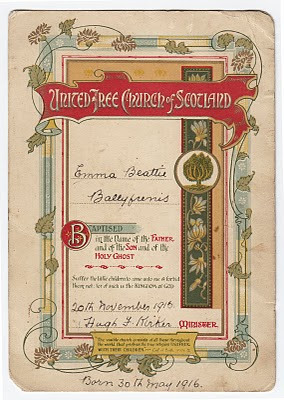 So shown left is a 1916 baptism certificate from Ballyfrenis United Free Church of Scotland, dated 20 November 1916. This is the church that my mother grew up in, and countless generations of her family before. I have blogged about the church previously. The only way that authentic, rooted, Ulster-Scots work will happen is at the firesides and kitchen tables within the Ulster-Scots community itself. Our folk are a canny, wary lot, but once trust and a bond has been formed, I have always found most people to be very willing to share their own knowledge, stories and collections. Just a few days ago, a man who I'd met for the first time just the previous week sent me an envelope packed with stuff he'd gathered up over the years. On Saturday evening, I bumped into an older man who I've got to know over the past few years who updated me about his relatives in Lanarkshire and how they are waking up to their Covenanter history. Another man passed on a few wee Ulster-Scots expressions from the area of Co Down that he lived in for a while. This richness only exists among the ordinary folk - the kind of people who FL Owsley called "The Plain Folk" - and who, if treated with the respect they deserve, are the salt of the earth. The sort of people that the controversy-manufacturers look down their noses at. I have a cousin who lives there, so maybe a trip should be planned?! Thanks to Crawford for sending me this ages ago, I've just refound it. If anyone out there knows where I can find the words and musical notation for this old County Down song please get in touch. 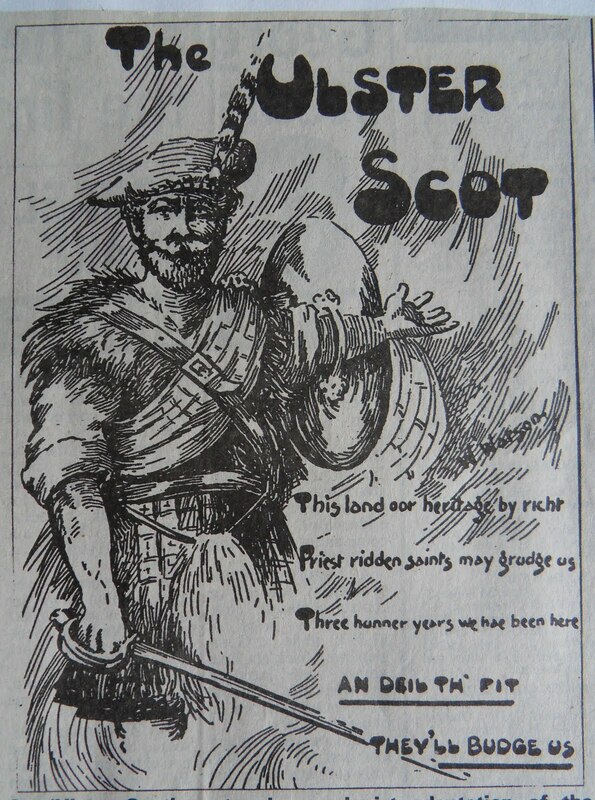 Who are the Ulster Scots? 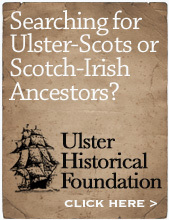 The answer given at the back is "descendants of Scottish Presbyterians who emigrated to Ulster". 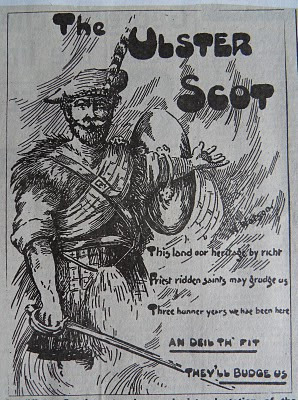 A simplistic answer perhaps, but it does show that in the 1940s there was a popular awareness of Ulster Scots identity. The booklets are full of simple history, vocabulary and expressions. 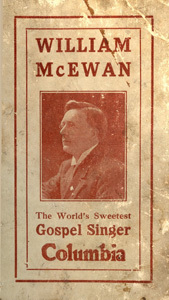 They were published by the Galleon Press of Ormiston Drive, Belfast, with the first volume published in December 1944. 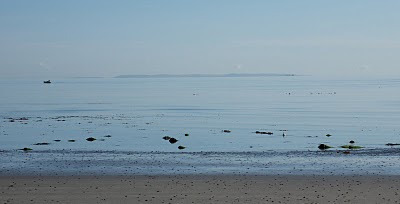 Clark wrote that Vol II had been completed "on the road to Mandalay" and that Vol III was completed "sailing amid the peace and beauty of our own Strangford Lough - a far cry from the Burma jungle". Vol 1, Quiz 13, Q7: Can you say what a "wheen o herns" is? Vol 1, Quiz 33, Q2: Whereabouts in Co Down is The Big Stane? Vol II, Quiz 17, Q5: The Grahams, a Scottish clan, were deported to Ulster and so gave this seaside village its name. Vol III, Quiz 25, Q5: What other King landed at Carrick as well as King Billy? Pic above - fragment of the gravestone of one of Bangor's Provosts or "Provest" (see how the stonemason was in two minds about whether it should be spelled with an "o" or an "e" ! ) Photographed at Bangor Abbey, June 2010. In my previous post, about John Luke, I included his mural of Belfast's Royal Charter. 2013 sees the 400th anniversary of King James VI & I granting Royal Charters to 14 towns across Northern Ireland and a further 26 within the Republic of Ireland. Locally, the three which are most relevant to me are the Charters for Killyleagh (10 March 1613), Newtownards (25 March 1613) and Bangor (18 March 1613). The full texts of the Bangor and Killyleagh charters are in The Hamilton Manuscripts - thanks to Ian Wilson for reminding me of that! • Bangor would be an "entire and free Borough"
• A "body corporate and politic" would be set up with one Provost, twelve free burgesses and a Commonalty. John Hamilton was the first Provost of Bangor (He was Sir James Hamilton's brother). These positions were to be reappointed every year - for the Provost his election was to be on the Feast of St Michael the Archangel / Michaelmas (Sept 29); for the Burgesses their election was to be on the Feast of the Nativity of Saint John the Baptist (June 24). • the right to elect two MPs to Parliament - "two understanding and fit men"
• the "Commonalty" was to be made up of "all the inhabitants of the said village, and all and such other men as the Provost and free Burgesses shall admit". • safeguards were also built in to get rid of any of these appointments, for example that in instances of "mal-administration and ill-behaviour in that behalf be removed". • convene public assemblies to "statute, ordain and establish acts for the good rule and wholesome government of the said Borough", and appoint two "Sergeants at Mace and other inferior officers or ministers necessary for better government"
• hold a "free market" every Thursday, and two other annual fairs on 11 November "to be held yearly for ever" and 1 May ﻿ "to be held yearly for ever". In a year where these dates fell on a Saturday or Sunday the fairs were to be held the following Monday. The Provost held the post of "Clerk of the Market". A document dated 1833/1834 also contained in The Hamilton Manuscripts (entitled 'Corporation Commissioners Report on Bangor') shows that the town and Borough of Bangor was, over 200 years later, running more or less on the basis set up by the 1613 Charter. Surely these Charters, and the stories of the towns, should be marked in some meaningful way? (Left: John Luke's mural at Belfast City Hall, showing Belfast's Royal Charter of 1613, painted in 1950. 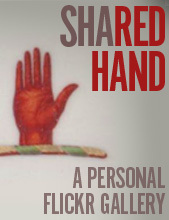 Click the image to enlarge). Even though I went to the Art College in Belfast (UU at Belfast, 1990 - 1994) I have limited knowledge of our local artistic heritage. I opted to take a commercial route with my own career - solving other people's communication needs and helping them sell products, rather than the self-expression route of the fine artist. So I ended up as a graphic designer with a love of old tourism posters. (By the way, if you hire a graphic designer and they present concepts to you by saying "well, what I wanted to do with this was..." you have my permission to shoot them. Their job is to answer your brief, not indulge themselves or enhance their portfolio. Too many these days flounce around like they're presenters on Changing Rooms). The Foundation and BAHons courses I took had no art history modules, but I made good money painting Iron Maiden album covers on schoolbags during my teenage years and can draw Gill Sans by hand - both of which I found far more useful than learning about dead Italian painters. However, one Ulster artist whose work I have always greatly admired is John Luke (1906-1975). The first painting of his that I saw was "The Road to the West" (painted in 1944) which was then (and might still be) in the UTV art collection. John Luke has an interesting background, in that his parents were from Ahoghill (some say Randalstown) and moved to booming industrial Belfast where John was born in Lewis Street. Apparently his early works included painting King Billy on gable walls. Later he painted the magnificent mural in Belfast City Hall which shows the Royal Charter if 1613 being read (see pic above). So I Googled him the other day and found to my horror that one of his public ﻿murals, about 30 feet by 20 feet, languishes in the possession of a Belfast demolition firm (see story here) - a firm who were involved in a publicly funded £20m construction project and who then claimed the Luke mural under a salvage clause in the contract. (The mural was probably paid for out of the public purse in the first place, by the old Belfast Corporation. You might also think that a firm who have presumably done very well from the public contracts over the years might demonstrate some goodwill and return the mural to the people of Northern Ireland?). Anecdotally, I am told that some of Luke's family were Brethren evangelists, but John became a vegan Buddhist and died in poverty from a malnutrition-related illness. Rory Fitzpatrick speaks of Luke's work - "...how many people looking at the work of the Belfast artist John Luke would recognize in it a theme going back to the beginnings of the Scots-Irish?... it is always Sunday in Luke's work, families walking their dogs through the green, drumlin country in the warm afternoon, or evening after work as a father comes home to a white Ulster farmhouse set in formal idyllic landscape. Luke himself called it 'the eternal, now' but it is in essence that curiously innocent Scots-Irish vision, the land of peace and plenty, often expounded in the past from Presbyterian pulpits and expressed in Biblical language...". (from God's Frontiersmen, p 274). If any of the Luke family read this, I would love to hear from you. NB - As far as I know, all of these paintings are copyright of Luke's estate, these digital images been sourced from various websites. "...The greatest of the myths is that of the non-existence of the Ulster Scots as a separate people with a distinguished history and rich traditions. Lip service is paid by British and Irish politicians to the idea of a Protestant cultural identity, usually by a polite mention of the Twelfth of July as a folk festival; no attempt is made to probe beneath the cultural surface..."
Rory Fitzpatrick wrote that, 21 years ago in his book God's Frontiersmen - the Scots-Irish Epic (Weidenfield & Nicholson, London 1989) p 274. It's almost a prophetic observation and it still applies today. ﻿The Twelfth is a fine day out, but as I've written before, there's far far more to our heritage than just one day in July. I was pleased yesterday to receive an email from The British Library to say that they have selected three major projects I led during my time at the Ulster-Scots Agency to be included in their Web Archiving Programme. The websites for Hamilton & Montgomery (2006), UlsterVirginia (2007) and The Covenanters in Ulster (2008) have been chosen. The purpose of the Web Archiving Programme is to "... select and archive sites to represent aspects of UK documentary heritage and as a result, they will remain available to researchers in the future. The British Library works closely with leading UK institutions to collect and permanently preserve the UK web... We aim to develop preservation mechanisms to keep your publication permanently accessible as hardware and software change over time." So these stories will now be permanently stored under the digital protection of one of the world's great learning institutions. With thanks to those who worked voluntarily with me on these three major projects, to Dr John McCavitt for his advice on the BL archiving programme, and to the British Library for deeming the projects to be important enough to preserve them for future generations. "Bouls doctor? We dinnae hae ony bouls, jist a wheen o plates". A wee bit of a plug - As well as our usual church events across Northern Ireland throughout the Autumn, Graeme and I are delighted to be taking part in ‘An Evening of Ulster Scots Music and Crack’ which is part of Newtownards Ulster-Scots Festival Week organised by Loughries Historical Society. The venue is the Londonderry Room in the Old Town Hall Newtownards. • Hosted by Newtownards man David Anderson MVO, MBE. • There will also be a talk on Asha Kiran School in India by Billy Curry. (a retiring offering will be collected in aid of the school). Entry is £6.00 per person, pay at the door (no tickets). There will be light refreshments and, if you're lucky, you might even get to see the old jail cell (see photo below) where many a troublesome Ulster-Scot has been held over the years! NB - numbers are limited, so please get in touch with me, or with Mark Anderson at Balmoral Perspective, if you want to go. Rumour has it that the refreshments might include proota breid which Mark will be making fresh that afternoon from spuds grown in his back yard, so he'll need to know how many drills to hoke up! I can vouch for his spuds - very good with some scallions and country butter. And his beetroot is very good too, but he hasn't disclosed his secret pickling recipe yet. ... I'm dusting down my Powerpoint talk on Hamilton & Montgomery (the second most important story in ever told). See you at 8pm in the Town Hall! Will post a report later on of how it went. UPDATE - went really well, I spoke for my allotted hour (had to skip a few bits to keep it down to the hour!). Between 50 and 60 people there, lots of questions at the end and lots of very positive feedback all round. I met folk tonight who are friends of my parents but who I'd never met before, local teachers, parents of schoolfriends of mine, a woman from Edinburgh who now lives near Carrowdore, a man from Ballintoy who now lives near Newtownards, even a few folk who admitted to having heard me try to sing!. They've asked me back again - the ultimate accolade. The critics of Ulster-Scots have no idea of how deeply our stories resonate within our local communities. Or maybe they do...? Media, politicians and assorted "experts" can spout whatever they like within their ivory towers. I know where I'll be - among my ain folk helping to preserve, recover and share our extraordinary heritage to whatever extent I'm able. The only sound was the put-put-put of the wee inboard engine, around 7.30am. I've lived all my life on the coast here, and the view to Scotland has been a regular feature of every one of my 38 years. 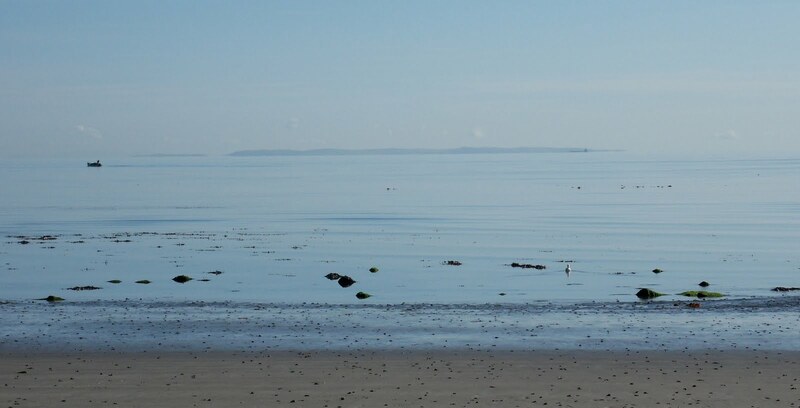 Some of my first steps were taken on this very beach (when my parents lived along the front of Ballyhalbert, before they bought the farm from the Johnstons, a farm my father had laboured on since he was a wee boy. His father and uncles had laboured those fields as well, as did their parents, as far back as family tradition goes.). All three of my own children have learned to walk on the same stretch of sand. I think most folk have places which are special to them - for me, the coastline from McCammon Rocks to Mooney's Brae is almost part of my DNA. Click the photo to enlarge. "...one more triumph for the crass stupidity rapidly replacing culture in this country..."
No, it's not about certain aspects of present-day Ulster-Scots activity (although you may feel that it could be), but is instead an excerpt from the football fanzine / magazine When Saturday Comes. Football isn't rocket science, and frankly it's not that important (even though I enjoy it immensely) however WSC has recently published two pieces ripping apart how even something as trivial as football coverage has been dumbed down. This article is about former Soccer AM presenter Tim Lovejoy, and this one is about the dire James Corden's World Cup programmes that dominated ITV's coverage of this years tournament. ...﻿no idea of his own limitations, never sensing when people are sick of him... underneath the insecure bluster, he may even be a nice guy... what he has to realise now, as he weeps over England's exit, is that he's part of the problem. Sure, it's only a laugh – but this overbearing oafishness bolsters the culture which has England stinking out one tournament after another, bullishly arrogant, proud of not thinking. Corden would probably scoff at the thought, but I guess you have a different perspective when you're making a career of it..."
The language in both pieces is rough in places, so be warned before you choose to click through. Apply the themes as you see fit. Not very PC, but I think a significant insight into popular feeling around 1912 and the "Home Rule is Rome Rule" fears of the time. I also vaguely remember seeing another postcard from the same era, I think recording the Larne gunrunning of 1914, which also bore an Ulster-Scots verse or poem. Maybe some readers know it and can send it to me to post here? Over at Aiblins.com, Mr Ulster Scot looks like he's hit the target with this one.... PS - Also, check this out. Sadly this commentator perpetuates the nonsense about "manufactured identity". It's not the first time that academics have dismissed something just because they'd never heard of it before. I have left a comment there (which has to be approved before it will appear). Perhaps some of you might feel inclined to do likewise? Even academics still have a lot to learn. Oops - doing a few tests with Blogger at the moment as I'm weighing up an upgrade, so bear with me if things go a bit weird round here for a day or two.